Any attempt to construct a linear narrative of technological process faces countless hurdles. 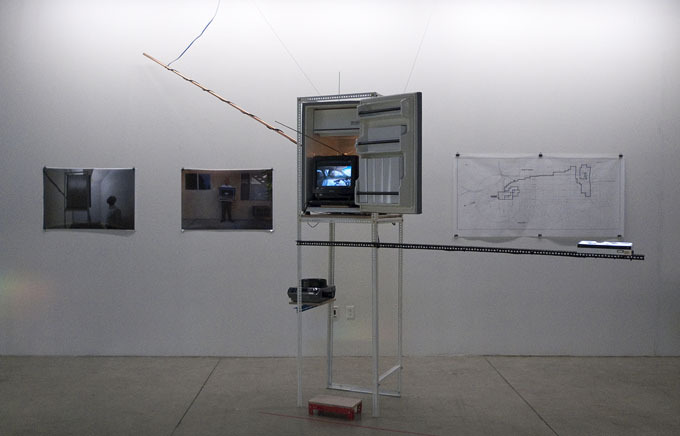 In embodying this narrative, Pohflepp's reveals its inadequacy through simple scrolling. Tsiolkosky's trick, of course, is narrative itself. Just as past serves as prologue, so too does the imagined future. Pohflepp's emphasis on the narrative impulse echoes an eternal critical obsession. While dreams and science fictions undoubtedly form a discursive basis for any potential future, the form of narrative itself may conceal as much as it displays. Paul Ricoeur reminds us that the stakes here may be higher than they appear: "Ultimately at stake in the case of the structural identity of the narrative function as well as in that of the truth claim of every narrative work is the temporal character of human experience.” Historian Hayden White has pointed out that the desire for cohesive is expressed not only in a desire to narrate, but also to "to give events an aspect of narrativity." In other words, narrative serves not only as a gloss over events, but is additionally injected into their very core. A certain critical consciousness is sacrificed within the narrative form. As Pohflepp's "Forever Future" project illustrates, technological development is frequently the result not merely of one piece of tech leading directly into the next, but of numerous discarded futures that give way to one model of future development. For that project, the artist created the fictional Robert Walker, a straw man for unfulfilled technologies and their corresponding futures. "What happens to technological visions when they do not come true? Do they just disappear or is there a place where they live on until they eventually may be materialized? Or are there phantom futures that might forever stay at a certain distance from us and can we even feel nostalgia for them?" Bruce Sterling provides some interesting examples: "Some media do, in fact, perish. Such as: the phenakistoscope. The teleharmonium. The Edison wax cylinder. The stereopticon. The Panorama. Early 20th century electric searchlight spectacles. Morton Heilig's early virtual reality. Telefon Hirmondo. The various species of magic lantern. The pneumatic transfer tubes that once riddled the underground of Chicago." What will be the rockets that form the counter-future of our space age? Before phantom futures can become the basis for Steampunk-style nostalgia, they are forgotten and removed from society's techno-narratives.